It’s no surprise mobile gaming took off first when it comes to monetizing mobile content/services, but in 2013 some other Chinese Internet services and mobile-only apps found that it wasn’t that difficult than previously thought. App ranking and analytics service App Annie released top trends of 2013 on iOS and Google Play. Since Google Play isn’t widely accessible in mainland China and the majority of Chinese users download Android apps through dozens of other stores, the revenues in China market recorded by App Annie are mainly from iOS platform. But it’s still interesting seeing the most revenue-generating non-game categories are dating, navigation, messaging, among others. 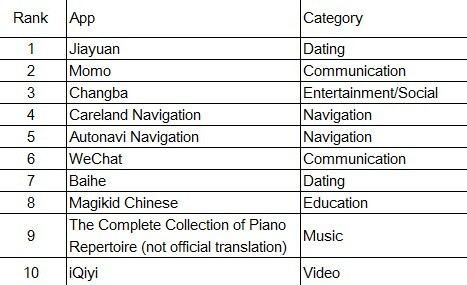 Mobile apps by online dating service Jiayuan.com (NASDAQ: DATE) generated the most money. Baihe, ranked No. 7, has a similar business model to Jiayuan’s that charges for user-facing online and offline premium offerings and advertising. Jiayuan apps, launched in 2011, reached 18.5 million installations in Q3 2013, about 20% of its total registered users. Mobile contributed 23% of its online revenues, 19% of its total revenues, in the quarter. The ARPU (average revenue per user) on mobile is lower that on the Web as users were not willing to pay large amounts of money on mobile, said Jiayuan management on the Q3 earnings conference call. A couple of separate mobile apps the company launched in 2013, hadn’t grown big enough to contribute meaningful revenues by year end. Navigation apps were among the most expensive mobile apps in China. Careland’s for iPhone and iPad charges RMB 108 (USD 18). After AutoNavi shifted focus from selling solutions to businesses to end users, navigation app was one of its major revenue sources. Autonavi navigation app could have made more money last year if it didn’t decide to offer the service for free in August, thanks to the challenge from Baidu who announced to stop charging its navigation app one day earlier than AutoNavi. It won’t be surprising that navigation apps disappear from the top ten list when 2014 ends, for those like AutoNavi won’t receive any revenue there this year and it’s expected that more users will switch from paid services to those for free. Both WeChat and Momo started monetization in the second half of 2013 and both are through mobile gaming, sticker shop, premium subscription alike. Momo began in late June with a major update and added mobile games later on. The location-based mobile messaging app announced 80 million users and claimed to have broken even in November. WeChat monetization became clearer in August 2013 after mobile games, paid emoticons and payment solution had been added. Mobile games would soon pocket good money. Other offerings such as shopping on Tencent’s online retailer Yixun would come on later in the year. WeChat monetization hasn’t taken off yet. Many believe it’ll be huge. 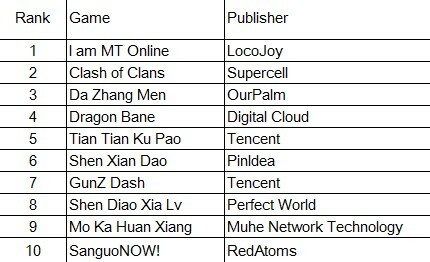 Below is the list of the top ten mobile games that made the most money in China from iOS and Google Play store in 2013.